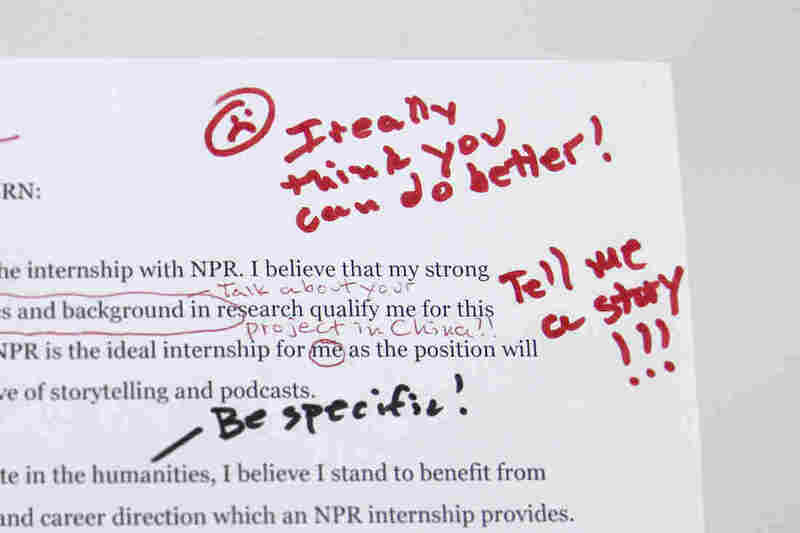 How To Get An Internship At NPR Ed : NPR Ed If your resume, your cover letter and your writing samples don't tell a story, we may not be interested. We've written a lot about the link between college and the workforce — and the kinds of skills graduates will need in the 21st century to succeed. One of the skills you need is knowing how to present yourself. To put your best foot forward in the workplace, and in life. And so, as we started to read the current round of internship applications, we have some advice for you. The problem we see, over and over and over again? Well, let's just say your cover letter needs some work. More often than not, the problems are there right from the very first sentence. Actually the first three words: "I am writing ..."
As in: "I am writing to express my interest in an internship" or "I am writing to apply for the internship with NPR." Think about that for a moment: You've written to us to tell us that you're writing to us to apply for the internship that you've applied for. In letters that start off that way, things usually head downhill from there. You're then probably going to tell us, in a lot of multisyllabic words, how you'll apply your creativity and your passion and your research and analytical skills, and the perspective you've gained in your academic work/daily blog writing/study abroad semester/volunteer experience to become a "dynamic" and "hard-working" member of our team. Read that sentence out loud. Try doing it without taking a breath. See what we're talking about? Continuing from there, you'll then praise us at NPR for our dedication to the mission of exploring the complex policy initiatives that are something something about America's something something education system. Then, having put us to sleep with writing like that, you'll tell us about your writing skills. Now, all of this isn't meant to poke fun at you. We're just trying to make it clear that, when you write us that paragraph, we pretty much tune out from there. Which is sad, because so many of you are amazing and talented students who've done some incredible things. You've started a nonprofit or traveled the world or raised a sibling or learned a third language or have insights into a culture or community that others don't know about. It's sad, too, because in many cases you really like us and really want to work here. Usually, you're about to tell us, that's because you grew up listening to NPR in the back seat of the car while your parents had us on the radio and you came to admire the work that we do. Here at NPR, that's what we do for a living. We tell stories, and the goal is to be interesting and exciting and make people want to keep on listening or reading. Stories have characters and movement ... well, you get the point. And so to introduce yourself to us right off the bat, and get us eager to know more about you, show us your stuff writing-wise. Let's illustrate. Which of these, drawn from actual examples, would you rather read? I am applying for the position of NPR Fall Intern. I believe that my strong interest in education topics and background in research qualify me for this internship. My undergraduate and postgraduate academic careers have taught me to critically analyze and synthesize large amounts of data quickly. I also have experience conducting research in corporate and office settings. The first time I ever went on live television, I was in Lahore, Pakistan. By the time I ended up in Pakistan this past January, being on camera wasn't new to me. I had several years of on-camera experience under my belt traveling around the world with an educational travel show for kids. When I lived in Los Angeles, I spent my hard-earned bartending money on TV hosting classes for a year. If you're like us, you'd much rather read that second one. It was written by one of our actual interns, Kat Lonsdorf. We're always afraid that, hidden down below, somewhere after that awful first paragraph, there's a fascinating person with great ideas. And we might not ever find out. It's a basic lesson of journalistic writing: Put the good stuff right up there at the top. Grab us and hold us and keep us reading. To paraphrase John F. Kennedy, don't tell us what you'll get out of the internship, but what you can do for us. As a recent college graduate in the humanities, I believe I stand to benefit from the development of skills and career direction which an NPR internship provides. It's so nice when we get letters from people who've made it clear they're interested in our topic: how learning happens, and that you've read what we do. Slip in a comment that shows you've listened to a story or two, or checked out our blog. And maybe tell us — without a lot of big words and jargon — what you think about schools or teaching or education. Instead of, "To Whom It May Concern," put our actual names (If you're applying to the NPR Ed internship, our names are at the top of this story) in the heading of your letter. ** Extra bonus: a story idea or two that you'd like to see us write about. We call this editing. Spellcheck is great, but take the next step: Have someone look over your letter to check for misspellings. They can find punctuation mistakes or long, clunky sentences. If you can't find someone, read your letter out loud. In the journalism world, all these things are important. But they might help you in lots of other fields, too. Good luck! We're looking forward to reading your letter. Oh, and the deadline is Sunday, July 15. This post was updated July 7, 2018.